Edraw offers you a number of ready-made brochure templates which you can use in your drawing and free. Edraw is used as a brochure software coming with ready-made brochure templates that make it easy for anyone to create beautiful brochure. 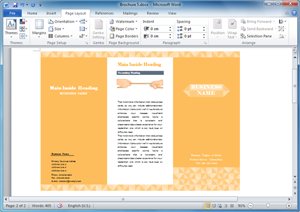 The brochure templates are easy to use and free. Edraw can also convert all these templates into PowerPoint, PDF or Word templates. Creating a brochure in Edraw is easy. It only takes a few seconds to choose a basic template, insert text and images, and add the finishing touches. 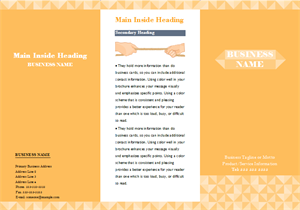 If you want to use a ready made template, go to brochure templates page and choose the brochure that best suits you. When you finish creating your brochure in Edraw, one click on the Export button will transfer your drawing into MS PowerPoint presentation. 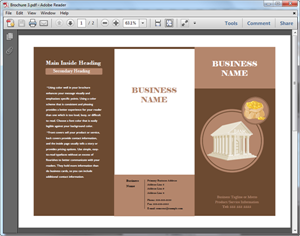 You need to consider few things when creating a brochure. 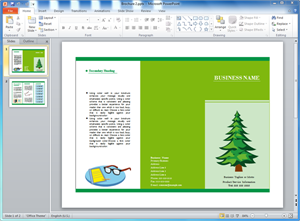 All are simple, only clicking on the Export PDF button will convert your brochure template into PDF. You can view the PDF brochure Template to view the quality. Identify and target your audience: Before starting the design process, its important to identify who you are writing to, and what do you want them to know. Use attractive headline and graphics: Usually the attractiveness of the cover page will determine whether one wants to continue reading the inside or not. Make sure it's succinct and easy to read: Be concise and avoid listing too much details on your brochure. Simplify your content and get rid of irrelevant information. Be unique and creative. Your brochure design should be original and unique so that people could easily recognize it with one glance. Ensure the layout is clean and organized: Structure the information and balance the components in a clear and organized way. Overdo images, graphics and texts will cause difficulty to follow the key content. Include call to action: An effective brochure should include a call to action, and that's your final purpose. Give readers an incentive to moved forward for your product or service, such as a free sample, discount coupon or gift. This will lead them to get to know your business deeper and include you as a consideration when they need such product or service. Discover why Edraw is an excellent program to create brochure. Try Edraw FREE.